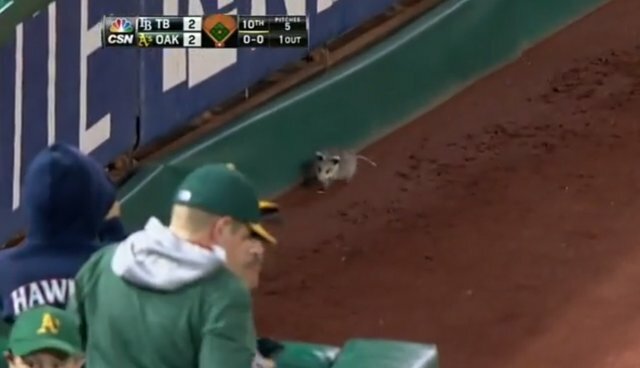 The Oakland Athletics are one of many major league baseball teams to not have an animal as a mascot, but after the spirit-bolstering appearance of a lucky opossum during a recent game, they may have found a one. After coming from behind to force an extra inning in Monday's game against the Tampa Bay Rays, the Oakland team desperately needed a run to break the tie. Just as A's player Sam Fuld stepped up to bat, a small, furry figure emerged scampering in the left field. It was an opossum. But not just any opossum; it was the team's ‘lucky' opossum. And she lived up to her name. Fuld then hit a single immediately after. Then he stole second base. Next, he made it to third base on a walk. Finally, he scored the winning running after a single base from teammate Derek Norris. "He's been out here before when we're warming up. We're going to have to give him a name or a jersey.... We'll keep feeding him, and as long as he keeps giving us enough wins, we'll be all right."